This Remington ammo is for people who are serious about self defense. 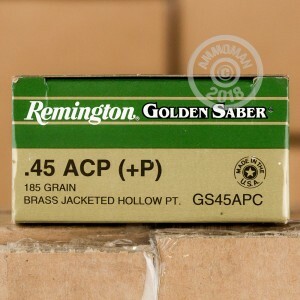 Remington Golden Saber ammunition has a high performance jacket, and has nearly 100% weight retention when fired into ballistic gel. This round has great expansion and higher velocities than the standard pressure round. 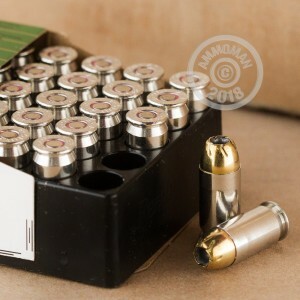 Each round has a reloadable nickel-plated brass case, is Boxer primed, and is non-corrosive. Order your supply of this top-of-the-line self defense ammo, and be prepared for anything. Remington has a long history of producing quality ammunition. For generations American gun owners have relied on Remington for all of their shooting needs. With their quality and reliability, it doesn't take a shooting expert to understand why. This ammo is loaded to +P pressures, so make sure you firearm is made to withstand these pressure before shooting. I selected these from experience. They have proven accurate as well as reliable in function in a number of pistols I've shot, and they offer just a bit flatter trajectory should it be required. AmmoMan is great in that they offer the shipping inclusive with a big enough order, enough to overcome slightly lower prices from a couple of other vendors. The Gold Standard in defense.